AUTHENTIC 27" X 41" , POSTER FOR THE MOVIE. A "RE-PRINT" OR A "REPRODUCTION" OR A " PRINT ". 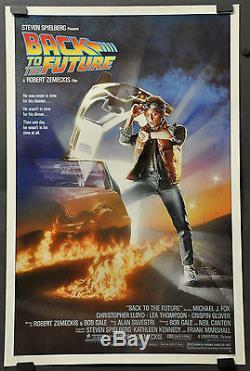 THIS IS AN ORIGINAL POSTER PRODUCED BY AND DISTRIBUTED BY THE STUDIO TO BE DISPLAYED IN THE THEATERS TO PROMOTE THE MOVIE. NOTE: UNLESS OTHERWISE STATED, THESE ARE ORIGINALS. THIS MATERIAL WAS USED FOR MARKETING PURPOSES. DUE TO THE FACT THAT THESE MATERIALS ARE OLD AND CAME TO US VIA THE STUDIOS, OR OTHER SOURCES INVOLVED WITH THE FILM INDUSTRY, THEY ARE NOT EXPECTED TO BE IN ABSOLUTE MINT/UNUSED CONDITION. ANY GLARE SEEN IN THE IMAGE IS DUE TO THE CAMERA ANGLE AND NOT A DEFECT IN THE POSTER. TO THOSE READING OUR POSTINGS, WE SELL ONLY ORIGINAL MOVIE POSTERS AND MOVIE RELATED MATERIAL. WE WILL NEVER SELL REPRODUCTIONS OR FAKES. WITH CUSHIONS INSIDE EACH END TO PREVENT ANY DAMAGE WHILE IN TRANSIT. WITH SIGNATURE CONFIRMATION UNLESS OTHERWISE SPECIFIED. NOTE: MAGNETS SEEN IN CORNERS TO HOLD THE POSTER FLAT. NOT PART OF THE IMAGE. 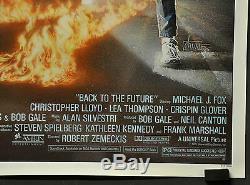 The item "BACK TO THE FUTURE 27X41 1-SHT ROLLED ORIGINAL 1985 MOVIE POSTER MICHAEL J. FOX" is in sale since Wednesday, September 12, 2018. This item is in the category "Entertainment Memorabilia\Movie Memorabilia\Posters\Originals-United States\1980-89". The seller is "legendmovieposters" and is located in Rutherford, New Jersey. This item can be shipped worldwide.